presented in Table 1 on the Guidelines and Policy Statements. Provide a fact sheet of eligibility criteria for physicians and patients for use at point of care (either print or electronic medium)—include a range of costs for screening. Do you coordinate the shared decision-making visit and LCS exam? AM: Primary care provides SDM and smoking cessation interventions during annual office visits using decisions aids supplied by the LCS program. This is the customary time for prevention interventions to be discussed. KS: SDM and smoking cessation counseling are both performed by the radiology nurse practitioner immediately prior to the LCS CT unless previously documented by the requesting provider. Our order set defaults to a request that includes the SDM visit and LCS CT scan; however, clinicians may choose to only order the CT exam if they would prefer to perform the SDM visit themselves. DTC: Built into our electronic health record order is a hard stop attestation requirement for SDM. The ordering physician has to select that they performed SDM before they can complete the order. The order also has a link to a PDF of our program’s SDM tool kit that can be printed out and assist with SDM during the point of care. CL: In the pulmonary clinic the SDM visit is often synchronized with the placement of the order for the next LCS scan. For example, the patient presents to the clinic to review the actual screening CT scan and then SDM is ongoing to determine continuation for next screening scan with an order placed at that time. CCT: In every office a best practice advisory will notify the provider of their patient’s eligibility for LCS. The EHR will pop up with structured fields regarding shared decision-making and smoking cessation counseling prior to an order for LCS CT order being accepted. In the nodule program, appointments with patients are paired with review of the CT finding such that shared decision-making and smoking cessation counseling occur prior to ordering the next study. What are the barriers to shared decision making from a physician perspective? What are the perceived barriers to shared decision making from a patient perspective? And, what barriers may be specific to minority populations? EJ: The National Lung Screening Trial (NLST) found a significant reduction in mortality among high-risk patients screened annually LDCT. A sub-group analysis of this trial by Tanner et al. showed that while patients in the screening arm experienced lower all-cause and lung-cancer associated mortality, this effect was even larger in African American participants.26 However, the availability of LCS among minority and socioeconomically disadvantaged populations is limited. National medical associations have called for the implementation of LCS services in minority communities; however, the realization of these programs has been challenging. We have identified four barriers to LCS in underserved minority populations along with strategies to overcome these obstacles. The following recommendations can be used for any racial/ethnic group, African Americans are highlighted as this is the population that our clinic treats. A. Access to screening: The disparity in lung cancer morbidity and mortality with in the African American community is well described.27,28 LCS has the potential to worsen this disparity if African Americans are not screened at the same rates as other high-risk groups. One of the major obstacles to successful LCS for minority patients is lack of access. The Ohio State University has two full service screening locations, one of which is located in an area that densely populated with minority patients as well as the medically underserved of all races. This location not only provides access to LCS services but also serves as an access point to other medical services for underserved populations. Develop access points for screening underserved patient. Screening within rural communities is also challenging. The future use of mobile lung CT units have been used in some areas and can provide cancer screening to rural communities, eliminating the transportation, financial, and resource barriers. B. Patient and Provider identification: African-American patients are less likely to be screened for lung cancer compared with non-African American patients.29 Many patients and providers are not aware of current LCS eligibility guidelines. Educational outreach to primary care providers (PCP) with a goal of assessing baseline understanding of LCS. Educational outreach to primary care providers (PCP) with a goal of assessing baseline understanding of LCS. Explain LCS rationale, guidelines and provide PCP offices with printed materials. In centralized programs ensure that PCPs know that the LCS program will follow positive screens. Identification of high-traffic locations: grocery stores, churches, barbershops, and beauty salons. Develop local relationships and provide information to organizations that empower minority communities such as the NAACP and National Urban League. Recruit African-American physicians, nurses and medical assistants. Invest in the patient’s overall health. Openly discuss mistrust of traditional medicine, fear of cancer and fatalism regarding cancer. Clearly explain how early detection and smoking cessation can save lives. Use personal testimonies from minority patients who were screened and have survived lung cancer. D. Community engagement: Community engaged programming may be more acceptable to communities that are historically distrustful of researchers or academic institutions. Recruit lay health educators from the community. Face-to-face patient education events give patients an opportunity to ask questions, meet with LCS staff and build relationships with care providers. CCT: In our program the nurse navigator provides outreach to a number of community programs and health fairs. CCT: CMS specifically outlines the requirements for shared decision-making visit and the elements within that discussion that meet the definition. Determination of beneficiary eligibility including age, absence of signs or symptoms of lung cancer, a specific calculation of cigarette smoking pack-years; and if a former smoker, the number of years since quitting. Shared decision-making, including the use of one or more decision aids, to include benefits and harms of screening, follow-up diagnostic testing, over-diagnosis, false positive rate, and total radiation exposure. Counseling on the importance of adherence to annual lung cancer LDCT screening, impact of co-morbidities, and ability or willingness to undergo diagnosis and treatment. 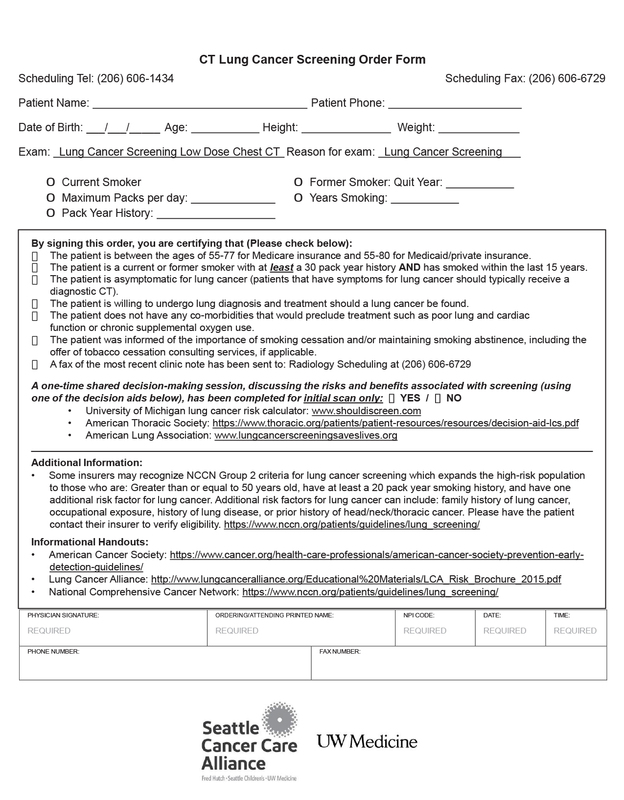 If appropriate, the furnishing of a written order for lung cancer screening with LDCT. ABK: There are several LCS risk calculators that can assist in shared decision making including key features, strengths and weaknesses and links to the calculator. The validity of these tools is unclear at this time and they should be used as a guide and not an absolute. Counseling on the importance of adherence to annual LCS, impact of comorbidities and ability or willingness to undergo diagnosis and treatment. A 20 percent reduction in lung cancer mortality with LCS in eligible patients following three rounds of LCS CT with 6.5 years of follow-up. There was a 6.7 percent reduction of all-cause mortality. Less than 1.5 mSv radiation exposure. Less than 0.5 percent intervention for benign disease. Who does the shared decision-making discussion in your program? ABK: Primary care physician or a pulmonologist most commonly conducts the SDM in our program. KS: Primary care physician’s office, advanced practice registered nurse (APRN) or other qualified healthcare professional, qualified healthcare professional at the screening site, or dual SDM–provider first followed by second discussion with a screening coordinator. The center can bill both visits if done on separate days. DTC: Shared decision-making occurs through two possible pathways: 1) conducted by primary care providers with material and educational support provided by the central program staff and 2) conducted by a dedicated LCS central program APRN. Built into our electronic health record order there is a hard stop attestation requirement for shared decision making. The ordering physician has to select that they performed SDM before they can complete the order. The order also has a link to a PDF of our program’s SDM tool kit that can be printed out and assist with SDM during the point of care. CCT/KK/RSW/KS: In our center, any physician can order an LCS exam and he or she must conduct the SDM visit prior to ordering this. A best practice advisory will alert the provider to the possibility that their patient may meet criteria for LCS. An LCS exam can’t be ordered without documentation of the SDM visit and smoking cessation counseling. What can a PCP say about screening if they have <5 minutes for the discussion? Brochure in office or sent to home. Letter or email with link to online decision aid. Review shared decision making tool prior to appointment. View a video made by one of our PCPs. Others are available online. What decision aids are available to use in the shared decision-making discussion? ABK: The summary table in the resource section describes several lung cancer screening decision aids including key features, strengths and weaknesses and links to the decision aid. None of the decision aids met all of the International Patients Decision Aid Standards Collaboration (IDPAS) criteria, however, most of the decision aids met the majority of the criteria. ABK/CT: AHRQ’s SHARE Approach is a five-step process for shared decision making that includes exploring and comparing the benefits, harms, and risks of each option through meaningful dialogue about what matters most to the patient. What are some of the things that you have found influence a person’s decision to get screened (or not get screened) for lung cancer? EJ/CCT: Our experience has shown a patient’s knowledge and awareness of lung cancer screening is the most important factor for successful screening. This knowledge is most easily gained through physician and patient interaction. Among patients who have an established primary care provider physician influence is also an important factor. Among patients who do not receive annual routine medical care or do not have an established primary care provider screening is much more challenging. These patients often are not screened for the following reasons. Who orders and/or schedules your LCS exams? CCT: Any provider can order and schedule an LCS study. They are ordered and scheduled in a decentralized manner. The EHR includes a best practice advisory which triggers consideration of an LCS study based on age and smoking history. Once an exam is ordered, the eligibility criteria are then assessed by radiology in a centralized way. If the criteria are not met, the radiologist will query the ordering provider and either cancel the study or change it to a diagnostic CT where appropriate. Each office has a different workflow for scheduling the study with radiology. In most offices administrative staff or medical assistants obtain prior authorization for the exam where necessary and schedule the study following approval. EMH: We started off having orders for LCS routed through central scheduling and switched to an EHR-based distributed model. The distributed EHR model is only as good as the vendor and IT implementation team allow it to be, however, and we are progressing back towards a centralized model. In our system, a central scheduling model seems to offer us the best chance of order success. I anticipate this will change again when we complete a system wide EHR migration project in the near future. SR/BM: All LCS exams are scheduled by one of our two program coordinators. LCS exams are not scheduled through central scheduling due to potential pre-authorization requirements. CF: In general, primary care physicians and pulmonologists enroll patients into the screening program. All orders for LCS studies are processed through our LCS program coordinator and vetted for appropriateness. To the extent that our EHR is able, patients who may qualify for LCS are identified and their provider is notified. The LCS study is ordered through the EHR as “lung cancer screening CT.” We originally had the order as “Low dose CT for lung cancer screening” and physicians would use the order for non-eligible patients because they liked the idea of low-dose. In addition, when ordered, a box comes up where the ordering provider has to check boxes to confirm eligibility criteria, confirm that they have performed and documented shared decision making, and confirm that they are enrolling the patient in the LCS program. The order is transmitted to radiology and the LCS program. The LCS program navigator confirms insurance coverage details, contacts the patient, confirms their understanding of out of pocket costs, and schedules the CT.
KS: The Vanderbilt University Medical Center referring providers may order the LCS study as they order other imaging tests and patients are then scheduled by the imaging center. We only perform these studies at our outpatient imaging facilities, which allow us greater control of scheduling (do not have to involve the main hospital ordering system). The imaging center schedules a consult appointment with the radiology nurse practitioner immediately prior to the LCS appointment. This allows the nurse practitioner to confirm eligibility criteria and perform a shared decision-making visit if necessary. CL: Program navigators, after reviewing for initial and continuing eligibility, will send an EMR in-basket message to the healthcare provider with a reminder of the patient’s eligibility, so that timely orders can be activated by the provider. It would be equally important to provide ordering providers prompts or reminders when patient eligibility has ended, so that imaging beyond the guidelines does not occur. CCT: Any office can schedule an LCS study once an order has been placed. Radiology will then review the eligibility criteria to ensure that the patient is eligible. Reporting requirements are maintained through the EHR within the ordering fields with mandated questions regarding shared decision making and smoking cessation counseling. RSW/KS: Our program is a hybrid. There is the option of either decentralized referral (PCP conducts SDM and places LCS order) and ordering of the study or centralized referral (PCP refers patient to an LCS / Pulmonary Nodule clinic for SDM visit and decision whether to proceed with screening; if yes, the sub-specialty clinic provider places LCS order). MKG: LCS studies are ordered by primary care providers and pulmonologists using a standardized order set in the electronic health record. Providers are required to check boxes to confirm that the patient is asymptomatic, meets eligibility criteria, has undergone shared decision making, and has been referred for tobacco cessation treatment (TST), if a current smoker. JM: LCS studies are ordered through a trigger in the patient’s electronic medical record (EMR) which triggers a clinical reminder for their physician to order a CT chest screening. The clinical reminder is based on patient’s age and smoking history. If a physician chooses to order a CT chest screening, they then perform a shared decision-making session with the patient to discuss the risks and benefits of CT chest screenings. Once the exam is ordered, the patient can call radiology to schedule their exam. CGS: The VA Portland Health Care System is a centralized program where SDM and orders are performed by dedicated LCS program personnel. PM: Any clinician in our health system can place an order for a consult to our LCS program. Our program administrator screens the order for patient eligibility. If the patient is eligible an order for the SDM visit and coordinated CT scan is placed, then signed by our program navigators. How do you ensure the correct initial LCS exam is ordered? SR/BM: We created an LCS request order that has no CPT code attached (and therefore cannot be scheduled/billed) that we ask physicians to place when they are ordering a screening exam. This request also falls onto a work queue and is changed to the correct order by a program coordinator based on the patient’s most recent exam. GM: We have an order that requires the completion of criteria eligibility questions. It then goes to a work queue for review by our NP who places the actual order. CCT: Any LCS order can only be placed in the EHR after the provider completes questions related to symptoms, shared decision making, and smoking cessation counseling for eligible patients. These are sent to radiology and screened to make certain the patient meets criteria prior to the study being performed. In the ordering process the baseline vs. follow-up examination are options and this is verified centrally in radiology. The order is changed where necessary. EMH: No system is perfect in this respect. We use a mix of distributed and central ordering with downstream checks to try to maximize adherence to recommended screening criteria. A robust IT implementation including hard stops for adherence to individual criteria is very helpful in this respect. How do you ensure the correct order is placed for follow up exams (to indicate it is an LCS follow-up) rather than a diagnostic chest CT when the next annual LCS is ordered? EMH: An annual lung cancer screen should not be considered a “follow up” exam. Annual rescreening is the expected result for most patients undergoing LCS. Our EHR currently makes no distinction between first and subsequent lung cancer screens; annual exams are simply ordered as LCS. For short-term follow-up chest CT exams (three-month or six-month, as directed by Lung-RADS™ category), the exam is typically ordered as a non-contrast chest CT at the appropriate interval. In the exam protocoling stage the technical parameters for the exam are prescribed to be concordant with best practices for LCS and nodule follow-up. CCT: In terms of follow-up examinations, ensuring LCS exam vs. other forms of CT scanning is challenging. Radiology reports should indicate which form of examination is appropriate for follow-up based on the initial findings. If there are no findings, the patient is returned to annual LCS exam. In our EHR, the orders specify initial low-dose screening or follow-up low-dose screening. All screening orders are reviewed for appropriate study classification in radiology prior to the exam being completed and changed if necessary. SR/BM: We have a separate section of our database to help catch incorrectly ordered exams before the patient arrives so we can fix them if necessary. We have an alert board that, among other things, informs us of patients in the screening program who have a regular (not screening-related) chest CT scheduled within the next two weeks. If this CT was incorrectly ordered and should be either a screening exam or a follow up to a screening exam, we can make the change at that time so the exam will be tracked appropriately. CF: All LSC exam reports are transmitted to LCS program in addition to the ordering provider. The LCS program physician reviews all reports and confirms appropriate follow-up (annual or otherwise) with respect to lung with the program navigator. The program navigator enters an alert into the EHR to be trigger a few weeks prior to scan due date. Eligibility for the LCS exam is reconfirmed prior to the follow-ups being ordered. What steps do you take in your program prior to an annual LCS exam to ensure the patient is asymptomatic? BM/SR: Prior to a patient’s annual screening exam, our database searches the patient’s record for any chest imaging (CTs or chest chest radiographs) the patient has had in the 12 weeks leading up to the screening exam. Often times chest imaging is ordered due to upper respiratory symptoms so this can cue us in if the patient is symptomatic. Further, patients receive a reminder phone call two days prior to their appointment where they are reminded that they should reschedule the exam if they have new or worse cough or shortness of breath, unintentional weight loss, or are coughing up blood. RSW/KS: Defer to PCP (or other ordering provider) to ensure patient remains an appropriate candidate for screening. CF: LCS program coordinates annual follow-up. Patients receive reminder letter and are called by LCS program navigator to confirm appointment. Patients are screened for symptoms by navigator using symptom screen form at time of call. Any symptoms are reviewed with LCS program doctor prior to scheduling scan. GM: We have a script that is given to the program coordinator. She performs a basic screen at the time of the appointment reminder call. DTC/CCT: As a part of the electronic health record order, there is a built-in hard stop attestation that the patient does not have symptoms. If that hard stop attestation is not completed, the order cannot move forward. Additionally, patients are queried at the time of their screening study as to any respiratory symptoms. If the patient is symptomatic, the ordering provider will be notified and the study may be changed to a diagnostic rather than screening CT; the study may alternatively be deferred if the symptoms are believed to be due to a URI, etc. How do you identify/track orders for LCS patients in your EHR? KK/CCT: Many programs utilize radiology databases for tracking orders and results. Transferring data into other management systems for surveillance is also a method to ensure tracking orders and completion of orders. Manual review of the database is often required to ensure this occurs. EHR systems can be programmed to create critical results for lung nodules that are sent to the ordering provider and the multidisciplinary team managing lung nodules at the institution. In our program we have a critical result reporting function, a notification to the nodule program, and a movement of these patients into a registry for management by the team. If a patient does not show for a follow-up or an order is not completed, the navigator can follow-up to ensure its completion or the reason why it was not followed if not clinically indicated. The team manages the removal of patients from the registry when follow-up is no longer indicated or a diagnosis is made. SR/BM/CCT: We have two order codes that are specific to LCS. One order is for the initial and annual screening exams and has the G0297 CPT code attached to it. The second is for follow-up low-dose CTs that stem from screening exams and has the 71250 CPT code attached. 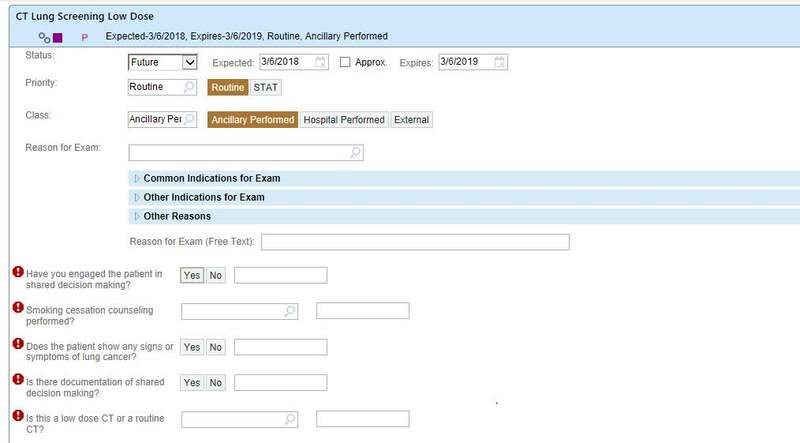 These exam codes fall onto a work queue in our EHR to be reviewed, pre-authorized, and scheduled; they also migrate into our LCS patient database. MG: Screening exams are tracked in the Radiology Information System by using unique exam codes. How are the results of the LCS exam reported by the radiologist? CF: Our radiologists use Lung-RADS™. There was some resistance at first due to lack of familiarity with format. This was overcome by education by the LCS program (run by pulmonary at our practice), providing a template in radiology reporting software, and current need for this format for data submission to an approved registry (required for reimbursement by CMS). CCT/RSW/KS: Our program reports findings of all LCS studies in a structured reporting system utilizing Lung-RADS™. Results are then tracked by the navigator of the program. EMH: LCS studies are reported in a standardized fashion using the ACR Lung- RADS™ classification system to categorize results and recommended follow up. We currently use institutionally developed tracking systems but are in the market for a commercial system to be shared among all regions. EJ: CT scans are interpreted using Lung-RADS™ within 25 minutes to allow for same day review of the results with patients.